The very name “still” photography suggests images without movement. But yet that is what a photograph is; a moment frozen in time. However images do not have to appear still to be a proper photographic image, they can depict movement and relay that sense of movement. Here are a few ways to go about it. Frozen Movement – When we see a photo of a moving subject that successfully depicts movement, we do sense it is moving even though the subject is perfectly still in the image. What we normally strive to do is to get the subject sharp, but in doing this any sign of motion such as blur is removed from the image. Therefore the subject is static and some element in the image must convey that the subject is actually moving. For example if the image is of a person jumping, once they are photographed in mid air, we immediately relate to the movement or action. We recognise that a person cannot naturally suspend themselves in mid air. 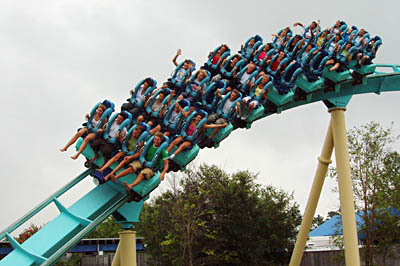 Some subjects we automatically recognise as moving even though there is no blur or defiance of gravity shown like the photo in fig 1 of a roller coaster. This image was taken using a shutter speed of 1/1000 sec in order to keep the moving subjects sharp. Other elements within an image can be used as well to depict motion or action. Water is a good example of an element that enhances the sense of action. When splashing water is captured it displays this action. However there is a few ways to emphasise movement in water. One way is to totally freeze every droplet of water seen in the image by using an extremely fast shutter speed. The opposite way is to show water in a total blur by using an extremely slow shutter speed. However both options, when executed properly, will depict motion in the image. Using Blur – In photography we generally strive to get our photos as sharp as possible. However there are times when the use of controlled blur can enhance an image and depict that sense of action. A fast moving subject in low lighting conditions will easily blur using automatic camera settings. Because the lighting is weak, an automatic camera will set the shutter speed to a slowish level and the subject will then blur. This can be further enhanced if the photographer knows how to set the exposure themselves. Blur can easily be created by holding the camera steady, preferably on a tripod, and use a slow shutter speed. What happens here is any moving elements in the image will blur and any stationary elements will become sharp. 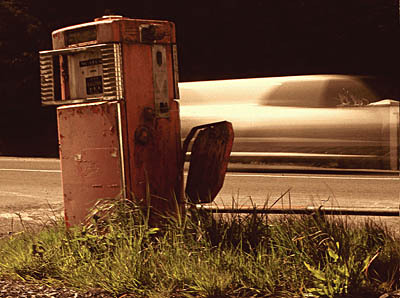 In fig 2 the old fuel pump is the stationary subject while passing traffic blurred. Another technique is to move the camera and follow the subject in the same direction it is moving while taking the photo, this is called “Panning”. In this instance the successful image will show the subject sharply, or even relatively sharp while the background is blurred. This blur is known as “motion blur”. To learn how to master the techniques of shooting moving subjects, enroll in our Creative Photography Course.